Two bills in Congress aim to fix the problem of how to label foods with genetically modified organisms, or GMOs, but they each propose a very different solution. The Genetically Engineered Food Right-to-Know Act, would function much like a Vermont law, but would apply nationwide. It would require the Food and Drug Administration (FDA) to clearly label genetically engineered foods. The alternative measure—the Safe and Accurate Labeling Act of 2014—sticks to the status quo, and prevents specific states from initiating their own label requirements. Opponents call it the DARK Act (Deny Americans the Right to Know). Given Congress’s current track record, neither measure is likely to make it very far, but support for disclosure has emerged in an unlikely place: Iowa, where biotechnology and agribusiness enjoy great support in the Legislature. In May, Vermont became the first state to pass a law requiring a label for foods made with genetically engineered ingredients. In June, the same trade groups that successfully crushed similar efforts in other states filed a suit against Vermont’s law. According to the Organic Consumer’s Association (OCA), the new law may also have an unlikely enemy: the organic dairy industry. 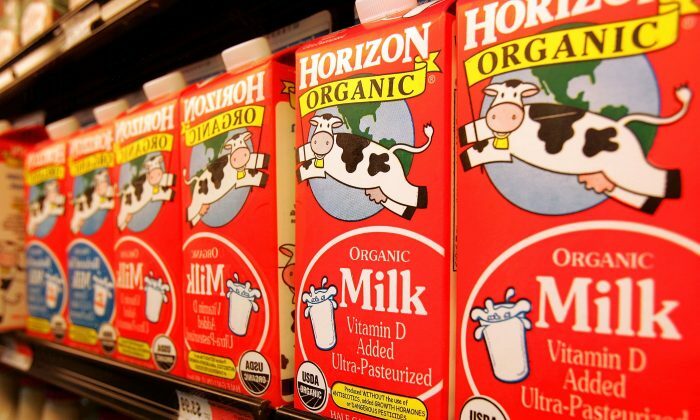 Leading organic dairy companies, including Stonyfield, Organic Valley, Aurora Organic, and White Wave/Horizon Organic are members of the International Dairy Foods Association (IDFA)—one of the groups suing Vermont for its label requirement. In a July 23 letter, the OCA urged these companies to sever ties with IDFA, and other trade organizations pursuing the lawsuit. “If your company continues to support the GMA (Grocery Manufacturers Association) and/or IDFA, consumers will have no choice but to seek out alternative brands sold by companies that are on the right side of the GMO labeling issue,” states OCA. In every state effort to identify GMOs it’s been trade groups at the forefront of anti-labeling initiatives, not individual companies—which have been careful to avoid consumer retaliation and hide individual donations to anti-labeling campaigns. IDFA has more than 550 member companies, representing 85 percent of the dairy products sold in the United States. Many of its members sell foods containing GMOs. The lawsuit against Vermont states that the industry “fundamentally disagrees with the message [the law] forces them to convey.” Under the Vermont law, food manufacturers will have to change all their packaging and advertising to identify genetically modified organisms (GMOs). However, organic IDFA member companies that have backed GMO labeling initiatives in the past said they do not support the lawsuit, and have stipulated that their membership dues not be put toward anti-labeling efforts. “Our involvement in industry trade organizations does not always translate into having the same opinion about issues facing our industry,” wrote Sonja Tuitele, director of communications for Aurora Organics, in an email to Epoch Times. Aurora, White Wave, and other organic dairy companies said they still support other IDFA interests like food safety, so they don’t want to break from the organization completely. A statement from Stonyfield said that like-minded IDFA member companies are trying to “use our influence to get the organization to change its mind” about Vermont’s labeling law. “We are just as passionate about labeling GMOs as the OCA, so it’s disappointing that they’ve attempted to undermine us with their latest report claiming we’re passively supporting opponents of GMO labeling,” Stonyfield stated. The U.S. Food and Drug Administration (FDA) permits companies to label GMOs on a voluntary basis, but none do. The food industry fear is that a GMO label will read like a skull and crossbones to consumers. While some companies, like White Wave and Stonyfield, support GMO labeling, no food company wants to speak in favor of hiding GMO ingredients. However, industry leaders said the biggest reason they reject state GMO labeling efforts is to avoid the cumbersome scenario in which each state would have its own requirements. Even if the label says all-natural – it may contain a lot of less-than-healthy ingredients!